All the cops from 6X63 precinct of the Hollywood Station are back in Hollywood Moon. There are surfer cops, Flotsam and Jetsam, “Hollywood Nate” Weiss, the lovely Dana Vaughn, and several other cops. Things are never as they seem in Hollywood. The latest case involves a man by the name of Cue Dewey Gleason. Gleason is a man of many faces and names. He runs a big operation. Gleason may be a master of disguise but even he is having trouble keeping straight, who is double crossing whom. The forecast calls for a Hollywood Moon! 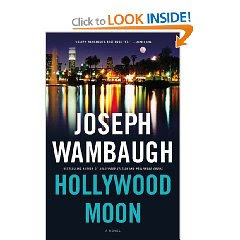 For anyone who has not tried Joseph Wambaugh, then I suggest checking out Hollywood Crows and Hollywood Moon. I first tried Mr. Wambaugh with one of his prior novels. While I found this work alright, I also found it a bit dry. I had the opportunity try out another one of his novels, Hollywood Crows in audio format and just fell in love. Christian Rummel is a very talented reader. He just brings these stories to life. Mr. Rummel has also starred in several episodes of Law & Order. Mr. Rummel does the voices for each character, in a way where you actually believe they are al different people and not just one person doing all the voice overs. I like all the characters. Listening o audio version of these books keeps me coming back for more. Be warned though that there is cussing and rude comments made by the characters. Like you, I read some of his earlier stuff and got tired of it. I saw this book at the library just yesterday but didn't pick it up. Next time I see it there, I will for sure after reading your excellent review! Linda - If your library has the book in audio, I suggest checking it out. Mr. Rummel does an excellent job of reading the book on audio.